If the roof has worn out to some degree or another, this does not always mean that it is necessary to change it completely. 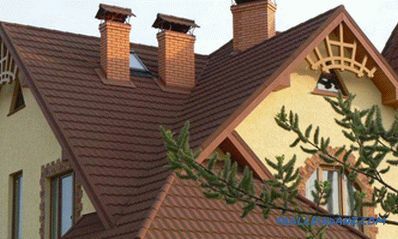 Repair of the roof of a private house - an event, quite sufficient in many cases. Depending on the degree of damage, this can be either capital works or a minor repair. The older is the coating, the more power and materials will have to be spent. But after that the roof will thank you, having reliably served many more years. Inspection and Assessment of the Roof Condition It is necessary to check if there is any dampness or mold. If the tree is heavily faded or covered with dark spots, it can be a result of constant moisture. Signs of worn roofing can be wet walls and ceilings in the rooms of the house. But in some cases, the roof of this may well not be to blame. Sometimes it’s all about the leaking pipes (water, sewage or heating). Not rarely there are cases when water flows on the outer wall, and then enters the house through the interfloor joint. Internal inspection of the roof is best done during heavy rain, then you can more accurately determine the location and causes of leaks. After a thorough study of the seamy side of the roof, it is inspected from the outside. 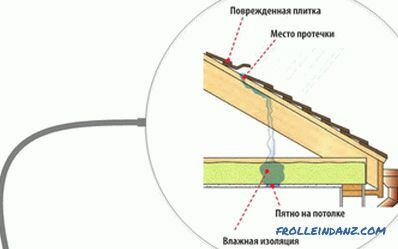 First of all, it is necessary to inspect such nodes of the roofing system as - a ridge to see if it is intact, whether its moisture barrier is in order. Then the places of adjoining the roof to the pipes and other vertical parts are the most vulnerable places. Therefore, it is necessary to check the metal aprons in these places. Then they gradually descend down to the valleys - perhaps they are full of branches and leaves that need to be removed and only after that can we see the element. The eaves board from time to time can rot away - therefore check it, and at the same time find out, whether the lower part of the eaves is intact. Now it remains to inspect the ventilation ducts and the drainage system (for clogging). Attention must be paid to each funnel, chute and drainpipe. Well, the roof slopes can become a haven for mosses and lichens - in this case they need to be eliminated. In addition, they are looking to see if there are bubbles, dents, holes or chipped cracks on the roof covering. By the way, many repair firms have infrared cameras in their arsenal. With their help, you can quickly find leaks and check the entire system. Then, on the basis of the obtained data, the calculation of the required amount of work and materials is made. 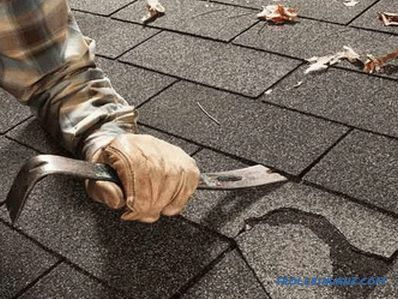 Tip: It is advisable to do a roof check every year, preferably in the spring. Then in the summer, if necessary, you can repair the roof of a private house by determining in advance what materials the extent of the repair will be required for this. Sometimes it is very difficult to find and understand the cause of a cattle roof leak. This is due to the design features of the roof, because water can flow in one place, and leaks will appear in completely different places. # 1. Violations of the integrity of the roof. # 2. 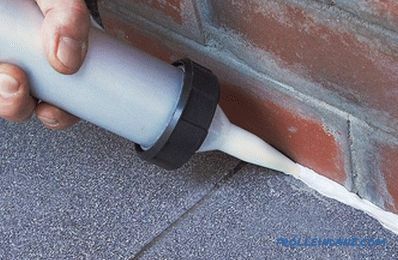 Roofing joints with walls and vertical elements, such as antennas, pipes and parapets, may be depressurized. # 3. Another common problem is the breakdown or failure of the drainage system. If the fasteners and roof covering material are of dubious quality, they will not last for long. In addition, there may be violations of technology during the installation of the roof. Because of this, there are excessive loads that destroy the roof. If inadvertently removing snow or ice from the roof and gutter can damage them, after which they will begin to collapse. Moss and fungi that have settled on the roof also spoil it, and in some cases this destruction process can occur much faster than you yourself can think. 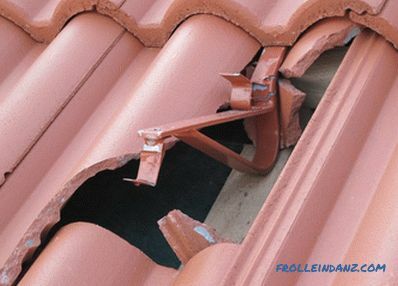 To prevent this, you need to timely perform maintenance of the roof. Destruction from time to time - even a very high-quality roof and a well-constructed roof, having been on the roof for a long time, wears out, requiring replacement or repair. As you can see, in theory, everything is pretty simple. But in real life, it is not always possible to quickly find a leakage place to repair the roof of a house. Sometimes water drops get inside the house when the wind blows from the side, driving rain or snow under the roof. It often happens that dripping from the ceiling is not at all where water gets inside the house.In such cases, it is better if the roof and the entire “roofing pie” are checked by professionals. At the truss legs the whole roof keeps, they take upon themselves the burden of the weight of snow, rain flows and gusts of wind and naturally the gravity of the roofing material itself. And if the rafters are damaged, then you should not hesitate. The problem must be solved immediately. In the damaged place, the skin, insulation and roof covering are removed, the crate is disassembled. 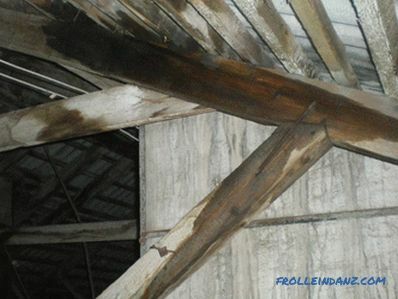 If the rafters rotted, well cleaned the affected place. Then they fill 80-100 centimeters long and 3-5 centimeters thick from two sides of the board. Attach them with long nails. It also happens that a piece of rafters rot until the very core. Then it needs to be cut out and set the bar prosthesis 2 or 2.5 times longer than the rotten part of the rafter. On its edges put lining. The entire structure is joined by nails 10 or 15 centimeters long. While the work is going on, temporary racks are put under the rafters, but after the bar prosthesis is installed, they are removed. Two ways to repair rafter legs. There is another option - the rafters are fully functional, but the crate is damaged and she is no longer under the weight of the roof. We liquidate cracks and deflections by replacing the sheathing or its reinforcement. To do this, lay timber between the rafters and stuff the boards in the transverse direction. # 1. All diseased parts of the rafter burned after their removal. # 2. Spread the cleaned areas with antiseptic. Next - vapor barrier layer. The latter is made of polyethylene, glassine, foiled materials, vapor-permeable membranes. An example of a roofing pie for a roof of shingles. 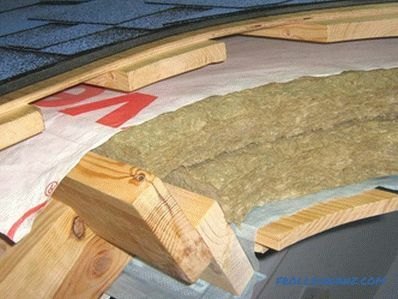 Consists of roofing material (flexible tile), waterproofing, two layers of basalt wool and vapor barrier. In case of damage to the insulation, there is still a lot of work to be done, but you can repair the roof of a private house yourself. To do this, remove the trim inside and get to the vapor barrier. After removing it, they are testing the insulation, checking if it is wet. All wet heat insulator plates need to be pulled out, replacing with dry ones. Dobrashit before waterproofing check its integrity. If it is whole, they settle this film back; if it is damaged, they change it. In this case, the waterproofing membrane must be laid so that it goes around the rafters, so it is attached to them with staples or nails. Cut insulating plates so that they are wider by 1 centimeter than the intergroup distance. Putting them, gently squeeze, and then placed between the rafters. Having straightened, the insulation will not fall out - it will hold tight. The joints between the first and second layer of the insulator should not be combined. If the second layer does not fit, increase the thickness of the rafter plates. Having stuffed nails on the rafters, they pull the cord over the insulation on them. A vapor barrier layer with an overlap of 7 to 10 centimeters is laid on top of the insulation, securing it with a stapler. For repair, it is enough to unscrew the self-tapping screws that hold the damaged sheet, and then replace this sheet with a new one. By the way, manufacturers give a guarantee for this roof from 10 to 25 years. If during the warranty period the metal tile has cracked, has lost its color or has exfoliated from the base, then it is quite possible to require replacement. If replacing a sheet with a new one is not possible, the crack and chipped polymer coating are pre-cleaned and degreased, and then painted over. But this repair will not last very long. If large gaps appear in the steel roof, they are covered with silicone sealant. Damaged paintwork is cleaned, degreased and coated with enamel of the corresponding color. If the damage is significant, then I put patches of new steel on the rotten parts of the roof, connecting them with the help of folded joints. There is already a more serious guarantee - from 30 to 50 years. It extends to the integrity of the tiles, their resistance to frost and protection from water. Naturally, with this, the laying technology must be observed, and the tiles must be transported correctly. Otherwise, the warranty will "fly off". 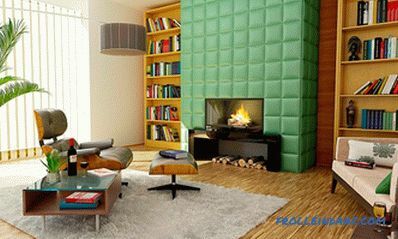 Do not change the material and when there are slight differences in color tiles of the tiles. During repair, both damaged and adjacent tiles must be removed. In the first place - the top, then - the side. Having driven a wedge under the tile next to it, it is necessary to pick up the edge of the extracted tile with a screwdriver (or trowel). New tiles are laid evenly, taking care of the tightness of the joints. The warranty period is from 15 to 25 years. Change this roof under warranty, if the granulate is frayed, has a non-standard form or is unevenly applied. Or the roof passes water, does not withstand weather conditions. But if improper installation, care or use in aggressive conditions, the warranty is lost. If the cracks in this coating are small, you can seal them. Raising the tile, we smear it with roofing glue from the inside, and then press it to the base plane, holding the glueing place for several minutes. However, it happens that there are a lot of cracks in the roof - then it is better to change it. Having pulled out nails on the necessary site it is cut, then the whole sheet of tile is inserted. Edges combine. 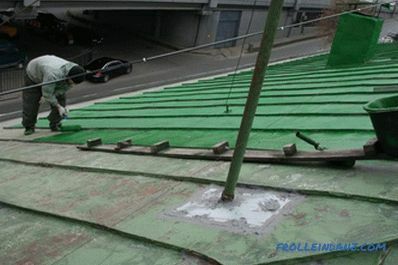 Work is performed at a positive temperature - from 5 to 25 0 C.
If the damage is minor, the following repair method will do (it is necessary to work when it is overcast on the street). After cleaning and washing the roof with a stiff brush (water is supplied from a hose), it is dried. Then apply the soil - diluted with PVA (glue - 1 part, water - 3 parts). Apply the prepared mixture with a layer of at least 2 millimeters, smearing cracks. For large damages the slate sheet is changed. For this, from a sheet that requires replacement, nails are completely removed. On the adjacent sheets, which press the removable sheet, the nails do not reach completely, but only raise it higher. 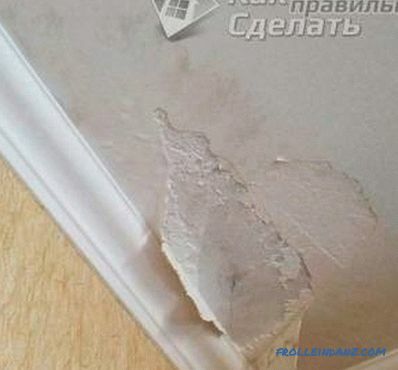 It is necessary for the neighboring sheets to begin to rise and allow them to get the damaged sheet and put a new one. By the way, the manufacturer gives a guarantee on slate - up to 15 years. Usually the drain starts to leak when the tightness of the connections is broken. Very often this occurs in the winter time under the influence of snow and ice. 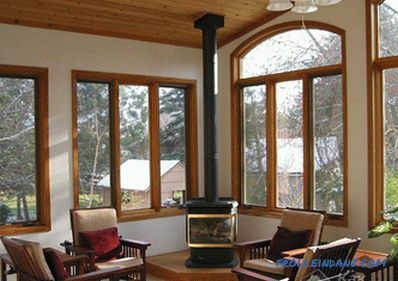 Therefore, if the system is made of PVC, then all the elements are usually connected on dichloroethane glue or rubber seals. If necessary, change them for ethylene-propylene rubber seals. But glue joints are more difficult to replace: you need to cut a piece of pipe, and then glue a new one using the same glue. 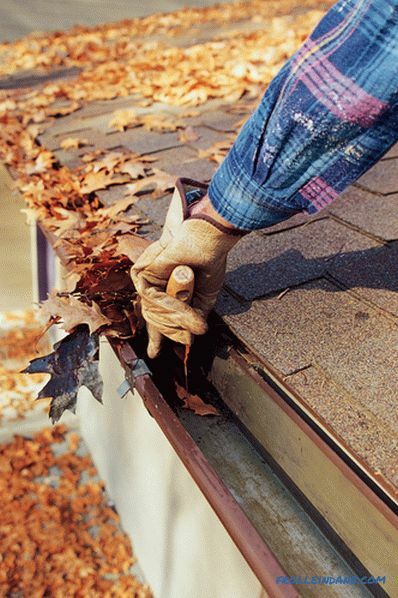 Separate elements of metal gutters are usually fastened with rivets, which should be drilled out when replacing parts. Replacing worn parts, they are riveted to each other, and a silicone sealant is applied to the joints. These places (ventilation outlets, chimney outlets, roof windows and antennas) require special attention and control. Their joints should be covered with roofing glue. Suitable and special sealing tape. There is also an option - to close these places overlays with decorative trim. And then after the repair, the roof of the country house will become both durable and elegant. Lastly, we invite you to watch an interesting video that shows the process of roof reconstruction in an accelerated mode.